The Water Framework Directive includes fish fauna as one of the biological elements, jointly with aquatic flora and benthic invertebrates, to assess and monitor water and habitat quality. Successful implementation of the Directive depends in part on the development of reliable, science-based tools to directly assess biological conditions. Although fish have been used as ecological indicators for more than 30 years around the world, mainly in North America and more recently in Europe, few studies have been done in Mediterranean streams. Fish assemblages of the Mediterranean basin, similarly to other Mediterranean areas such as California, have particular characteristics that hamper IBI’s development: few native species, poor knowledge of their ecological requirements, high number of endemisms with a wide range of tolerance to environmental variations and many exotic species. This chapter summarizes our experience in developing fish-based tools in Catalonia. We discuss the challenges and difficulties to develop these approaches in Mediterranean streams. 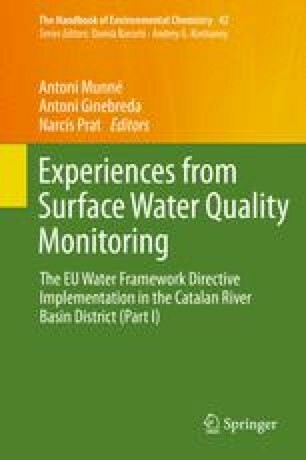 We show the IBICAT2010 as a fish-based assessment method suitable for the evaluation of the ecological status of Catalan rivers. Moreover, we assess size-related variables as a bioassessment tool because population size structure can provide insights into species-specific applications and management. Finally, we analyse the longitudinal connectivity throughout Catalan rivers and fish passes by using the index of river connectivity (ICF) specially designed to Catalan rivers. We gratefully thank everybody who helped in the fieldwork. These studies were funded by the Catalan Water Agency. Additional financial support was provided by the Spanish Ministry of Economy and Competitiveness (projects CGL2009-12877-C02-01, CSD2009-00065), the Sant Celoni town council (“Observatori de la Tordera” project, led by Dr. M. Boada), the Obra social of UNNIM savings bank (2012) and the funds for conservation of the Spanish Fundación Biodiversidad (“Riberes del Ter” project, 2013).